Blog - Flash Sale on 90% Junk Silver! 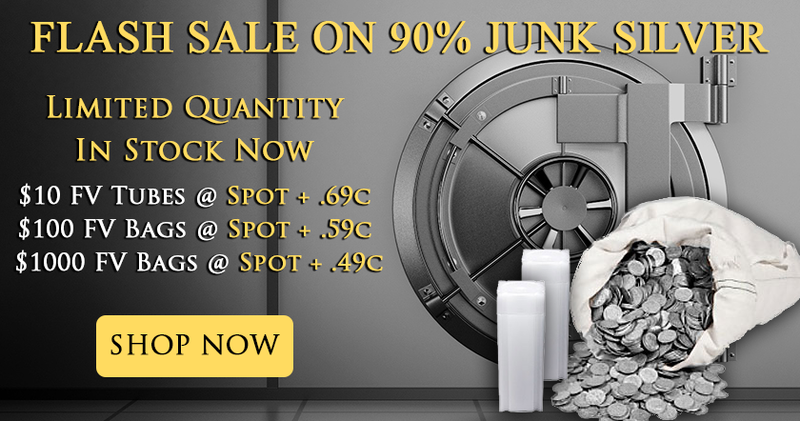 Flash Sale on 90% Junk Silver! During uncertain times like these, concerned investors turn to 90% “junk” silver as a trusted store of value. There’s a reason why pre-1965 American coins are called “survival silver.” These coins are U.S. government-issued, universally trusted/recognized, and available in small convenient units. They’re perfect for potential trade or barter. There’s one more major benefit to 90% silver: low premiums. This is especially the case today. Right now, junk silver is priced at an absurdly tiny premium. These pre-1965 coins have major advantages over rounds and bars, yet they’re available for an even lower cost! For just a tiny amount over melt, you can own one of the more versatile, ready-accepted and popular forms of silver bullion. However, these favorable premiums won’t necessarily last. Economic and geopolitical scares often lead to increased demand for 90% silver. We’ve seen this phenomenon many times in the past. Since junk silver is no longer made and there’s a finite supply, a wave of demand often results in a premium spike. This is one important reason to stock up on 90% silver while prices are low. We’ve been fortunate to buy some large groups of 90% silver in recent weeks. At these ridiculously cheap premiums, we couldn’t say no! Our gain is yours too – and we’re offering you an outstanding wholesale deal on junk silver. To put these prices in perspective, in our 13+ years in the bullion industry, we’ve never seen 90% silver premiums this low. We’ve also seen this material trade for $4.00 or over $5.00 per ounce over spot! Just two summers ago, we remember dealers desperately trying to find 90% silver at 30-40% over melt! We strongly encourage you to take advantage of these special wholesale premiums. If you’re looking to diversify or secure your holdings with silver, we can’t think of a better way to accomplish your goals. P.S. Looking for a specific denomination or design? We have you covered! Click here for our complete selection of 90% silver. We have Dimes, Quarters, Halves and Silver Dollars in stock and ready to ship.